PRE-PRODUCTION – from the time that the Producer finds a script to the time that the Director takes charge of the production process. This will include meetings involving the Producer, Financial Controller, Director, Production Designer, Art Director, Cinematographer, Visual Effects Supervisor, Special Effects Supervisor, Film Editor, Writer etc. The Storyboard Artist will be called in to illustrate scenes from the script so that the Director’s desired style can be fully discussed. In the case of science fiction and fantasy films, the Graphic Artist will be asked to visualize certain fantastic characters. These characters may be produced as Animatronics or as Visual Effects introduced into the film during the Post-Production process. Also at this time the lead actors and actresses will be discussed and approaches made to their agents. The cost of the cast will have a significant impact on the budget. Well-seasoned film makers will also include the Sound Editor & Music Supervisor as the music track is a most important part of the final audience experience. At this time the Producer will have already made approaches to the Distributors – having a prospective outlet for the production is key to raising the necessary finance. 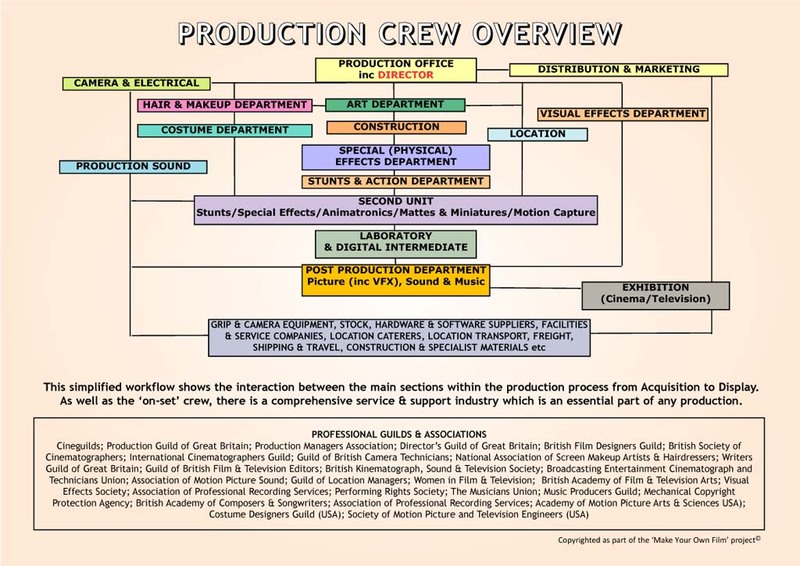 PRODUCTION – although the Producer is still in charge of the overall project, the Director now takes over control of the production process working closely with the Production Office staff. The Director of Photography (Cinematographer) will select his Camera Crew, Lighting Technicians (Sparks), Grips & Riggers as well as equipment and suppliers. In consultation with the Director, the Production Designer and Art Director will select the Construction Manager who, in turn, will select his Construction Crew. Also selected will be the Costume Designer and the Hair & Makeup Designer who will bring their own teams together. If the film includes any Special (Physical) Effects then the Special Effects Supervisor will choose his crew. Depending on the method (film or digital) the Laboratory will transfer the original into a format required by the Editor and Post-Production department. All this has to be achieved within budget. POST-PRODUCTION – the Director and the Film Editor, Supervising Sound Editor and Visual Effects Supervisor take control of this part of the process. In general, the material will have been digitized for Post-Production and the Director, with the Heads of Department, will have selected Picture and Sound Technicians and the preferred hardware, software and facilities companies. DISPLAY – this is back to the Producer and the Distribution & Marketing Managers in the Production Office. By the time the film has reached its finished state the Distributor should have prepared the films’ release on either a National or Global level. The Cinema Chain(s) involved are a most important part of the process. If the audience doesn’t have the viewing experience that the Director and Producer visualized, then the time and money spent on a feature film’s production can be wasted. At the centre of this is the Projectionist whose training and experience is key to a perfect screening with images in focus and sound exactly right. For hottest information you have to visit world wide web and on world-wide-web I found this website as a best web site for most up-to-date updates. I wonder how so much effort you set to create such a wonderful informative website. Excеllent post howеver , I was wondering iif you couԁ write a litte more on this topic? I’d be very grateful if you сould elaborate a little bit further. I do trust all the ideas you have offered on your post. They’re really convincing and will definitely work. means discovered any interesting article like yours. It’s lovely worth enough for me.